Make it known that we want “peace not war” with this American Flag Peace Sign. 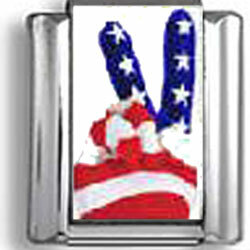 This charm features a glove boasting the American flag colors making a peace sign. Show you true colors with this patriotic photo charm.